Following its biggest London event to date, selling out the 5,000 capacity Printworks last month, Glitterbox recently announced its return to Ministry of Sound for a five-date residency. The next five London parties on Saturday 13 April, 27 July, 12 October, 9 November and 14 December will see the brand at Ministry Of Sound, its long-time home in London. The party continues to break new ground internationally with the tour touching down in New York, Dubai, Amsterdam, Belgium, Germany and for 20 dates at Hï Ibiza over the summer. 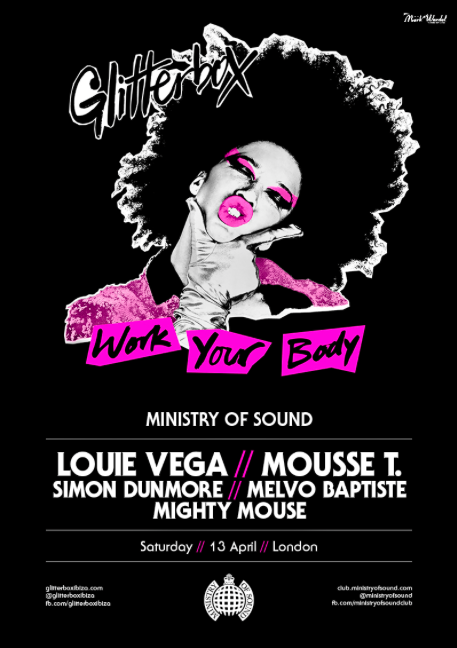 Kicking the series off at Ministry on Saturday 13 April will be Louie Vega and Mousse T., as well as Glitterbox residents Simon Dunmore, Melvo Baptiste and the producer of one of the brand’s recent tracks ‘The Spirit’, Mighty Mouse. More artists from the house music world are set to headline, soundtracking the night with the usual mix of nu disco, vocal house and classic anthems. Further line-ups will be announced in due course.